There are two parts to studying an ancient textile when you are looking to understand it. The first is the obvious analysis of all the parts of the structure. The second is examining the ways the textile expresses the values and beliefs of the culture it came from. Why do I need to study the meaning if my goal is simply to recreate it? For many textile traditions in the world, but especially in the Andes, structure and meaning were (and still are) intertwined. In the ancient Andes textiles were the primary means of expression and communication. An example of this idea that may be familiar to some of you is the Inka quipus or counting strings. Recent research (see links post) has uncovered potential ways that these strings recorded not only numbers but other ideas such as the structure of communities in two halves, upper and lower. The complex techniques like those which make up the Wari tie dye pieces developed through a similar desire to express not only social structure but spiritual beliefs. Therefore, if you only analyze the technical aspects you will not know the reason for why it was developed in the first place. This post will focus on learning how the tie dye fragment was made. In July as a part of my Andrew Mellon internship at the Carlos museum I studied a number of textiles including the fragment. Getting a work space set up was challenging because here, as is the case in many museums, there is a real shortage of study space. I was lucky and got a table set up in a gallery space that was temporarily empty. Here is my rather disorganized table. All objects in the museum have to be transported on carts so there is one in the background. We use special cardboard boxes that have no acid in the paper to store them in as you see here. Often the textiles are on custom size trays so we can stack them. The Wari fragment is sitting on its tray here as it is easier to move that way. But it also restricts your ability to examine it. I couldn’t lift this up to see the back for instance or get a good look at some of the edges. There are a range of tools available to pull apart (sometimes literally!) 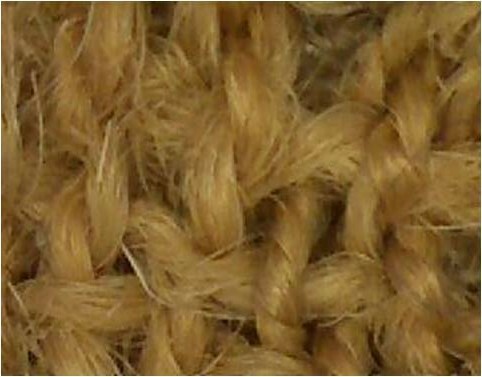 a textile that come from a variety of sources. Very few tools are made specifically to study museum objects; I used dental tools to very gently poke into the structure of this fragment. You also have to use some form of magnification (I used the head magnifier you can see on the table). When I evaluated this fragment to begin my replica the first thing I did was to determine the fiber and construction of the thread. 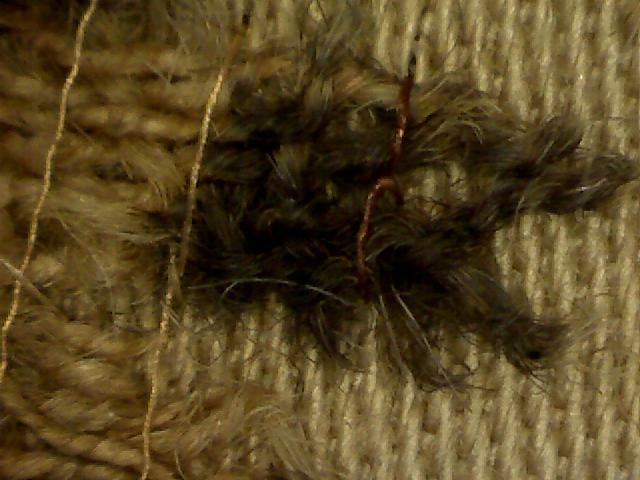 The fiber was easy because we know that this fragment is from a high status garment from the mountainous region of Peru. These were usually made with llama or alpaca fiber and from looking at the thread I could tell that all the threads were one of these two. They are long and shiny which rules out cotton, the other possibility. It was also possible to see that each thread was made up of two wound together. It can be hard to see if a thread is plied or not. If you look very carefully at the threads running vertically here, especially at the bottom you can see that that each is in fact two thinner threads wrapped around each other. As you can imagine, this is very hard on your back because you are constantly leaning over the textile. It is even more difficult to get good photographs if you are not a professional photographer, which I certainly am not! I was introduced to the Proscope the during this examination which is a wonderful tool because it helps to solve both of these problems. It is a hand held microscope that you can attach to your laptop with a built in camera so it can take photographs and video footage of whatever you are looking at! All of the extremely close up photos you will see in my posts were taken with this tool. There are some limitations though. The light contained in it does not provide good lighting so the photos are somewhat dim. It also has to touch the surface so you have to be VERY careful and make sure the area you are looking at is not fragile and frayed.